The new mandatory privacy breach notification provisions to the Health Information Act (HIA) were proclaimed in May 2018 and takes effect on August 31, 2018. Custodians will be required to notify the Office of the Information and Privacy Commissioner (OIPC) and the Minister of Health, privacy breaches with risk of harm. If you haven’t updated your privacy breach management policy, trained your staff, and prepared your reporting procedures yet, let me help you with done-for you templates and training! 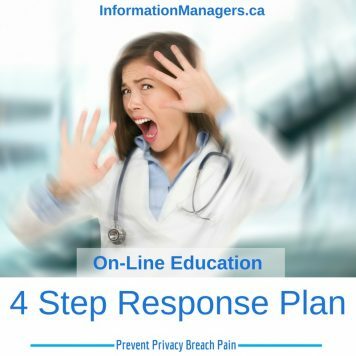 Introducing the “4 Step Response Plan” on-line education with quick and helpful content so that you will properly manage a privacy breach. This is critical to the continued success of your business. 60% of small and medium business owners go out of business within 6 months after a privacy and security breach. Patients, clients, employees and business partners trust you to keep their private and sensitive information confidential and secure. Mandatory privacy breach reporting is quickly becoming a legislated requirement – and many businesses are not prepared! Not recognizing and not notifying a privacy breach quickly and properly could result in fines and even jail time for the business, healthcare provider, employee, or vendor! Learn NOW how to respond a privacy breach – Don’t get caught scrambling when a privacy breach happens. Many healthcare practice managers, owners and privacy officers can’t get past the idea that simply hoping that you won’t have a privacy breach is not a good business strategy! Understand why a privacy breach is a significant problem. Understand the cost of a privacy breach and why you need to be prepared now. Use the 4 Step Response Plan to develop a privacy breach management plan. Prevent a privacy breach from happening again. When you have a privacy breach you must recognize the breach, contain it, notify the affected individuals, and prevent it from happening again. When you have this plan you will have confidence that you have identified and managed your areas of risk and dramatically reduce the risk of a privacy breach. Your staff will recognize a privacy breach early and respond quickly. You will manage the breach with minimum of risk to your patients, clients, and your practice. In the world of privacy breaches ‘If’ has become ‘When’. Will you be ready? Downloadable resources, checklists and templates New! Privacy Breach Reporting Form to make it easy for you to meet your notification requirements. Exclusive to registered participants – collaboration with others to help you solve problems and Jean will be there to answer your questions and encourage your progress. Coaching and facilitation using open office live webinars with Jean to help you overcome obstacles so that you can get your privacy breach management plan finished! This on-line education program may be eligible for Continuing Professional Development credits with your professional association. Self-paced And Self-learning – All Lessons Are Available Right Away – No Waiting To Get The Content That You Need Most! So if you’re a privacy officer, practice managers, healthcare providers, or a clinic manager who needs to know how to respond to a privacy breach but doesn't have a step-by-step plan ready to implement you need to act on this right now. When you have your privacy breach response plan in place you will have confidence that you are prepared to respond to the breach with confidence. You will save time and save money. Your staff will recognize a privacy breach early and respond quickly. You will respond to the breach with a minimum of risk to your patients, clients, and your practice. Jean L. Eaton, B. Admin, HIM, CC is constructively obsessive about privacy, confidentiality, and security when it comes to the handling of personal information, particularly in primary health care settings. Jean provides solutions that are practical and effective for today’s healthcare providers so they can implement privacy by design and best practices to protect privacy, confidentiality, security of personal information. Jean specializes in making practical recommendations for 1000’s of independent health care providers and comply with privacy legislation while improving efficiency in their practice management. Jean is a consultant and speaker on the topic of privacy breach management, including ‘virtual privacy officer’ on demand. She is the privacy awareness training facilitator to hundreds of medical clinics and healthcare practices and organizations that support independent healthcare businesses and privacy officers across Canada and the US. With over twenty years of experience, I have the knowledge and tools to help your business improve your information privacy practices. I’m delighted to share this with you now in this course. So go ahead, click the order button right now and you're well on your way to privacy breach management plan success! Email Jean with your questions. Jean L. Eaton is the host of the Privacy, Confidentiality and Security Workshops for Your Healthcare Practice © series.